In our recent SoundCast interview with David Buckley, we mentioned a brand new feature ... a special COMPOSER COMMENTARY. We figured ... why should DVDs and Blu-rays have all the commenting fun? 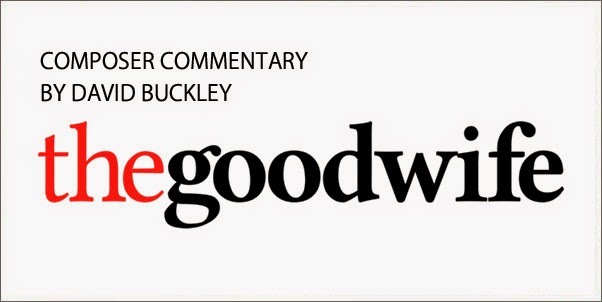 David Buckley was kind enough to sit down and comment through five of his compelling pieces found on his recently release soundtrack for THE GOOD WIFE. Track 6 Commentary - "Partner Vote Sting"
Track 8 Commentary - "Plaintiff's Partita"
Track 11 Commentary - "Felon's Fugue"
Track 19 Commentary - "Countdown to Execution"
We hope you will take a listen and appreciate the insights he provides. Please do check out our interview with him to get even more details on the story behind the TV-series' score and the soundtrack release. And if you like this new feature, we'd appreciate you taking a moment to let us know in the comments below, hitting the like/heart button above and sharing it with others! We'd love to do more of these and your feedback will go a long way to determining if we do!